The U.S. Defense Advanced Research Projects Agency (DARPA) is developing a prototype line of cost-effective reconnaissance satellites that will set up shop in low Earth orbit, as part of a program called Blackjack. The U.S. spy-satellite network will get a serious makeover in the next few years, if all goes according to plan. Most U.S. reconnaissance craft are purpose-built monoliths that operate in geostationary orbit, about 22,300 miles (35,800 kilometers) above Earth. Though these singletons are extremely capable, they're expensive, typically costing $1 billion or more to build, launch and operate. And it takes a decade or so to develop each one, said Paul "Rusty" Thomas, of the Tactical Technology Office at the U.S. Defense Advanced Research Projects Agency (DARPA). U.S. military leaders want to change this situation, and they're counting on DARPA to get the ball rolling. The agency has mounted a program called Blackjack, which aims to loft a network of 20 prototype spy satellites to low Earth orbit (LEO) in 2021. These craft will be incredibly cheap compared to the current crop: The goal is get each satellite built and launched for about $6 million, said Thomas, the Blackjack program manager. Blackjack aims to meet this ambitious cost target by leveraging developments in the private space sector. Several companies plan to establish huge constellations in LEO in the next few years, to deliver cost-effective internet service to people around the globe. SpaceX's Starlink network, for example, will feature thousands of individual satellites. Blackjack will integrate reconnaissance and communications payloads into standard commercial satellite bodies (known as buses) and take advantage of the high launch rate required to loft the mega-constellations, Thomas said. "The Blackjack approach assumes that we're not going to be an anchor tenant. We're not going to be driving these companies," he said during the FISO presentation. "But we want to take advantage of that production line of spacecraft, the buses especially, that they're going to be building. We want to take advantage of that launch and take advantage of all of those pieces." And there are advantages to setting up shop in LEO, just 620 miles (1,000 km) or so above the planet, in addition to the relatively cheap ride. Signal strength is about 1,300 times higher there than it is in geostationary orbit, Thomas said, and communications get down to Earth faster. But we can make some informed guesses, based on what DARPA envisions the LEO constellation doing. For example, the new constellation will likely improve U.S. missile-warning and missile-defense capabilities and augment the current global positioning system navigation network, among other duties, Thomas said. These duties will be dispersed among the various craft, he added. DARPA may end up selecting dozens of different payloads, but each individual satellite — which will likely weigh between 220 lbs. and 880 lbs. (100 to 400 kilograms) — will carry only a couple of payloads. Blackjack is a pathfinder, not an end in itself. 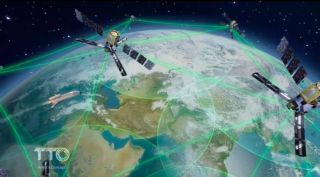 If the prototype network works as planned, the U.S. military aims to set up a LEO constellation of 90 satellites, Thomas said. This larger network could be up and running as early as 2022, he added. And there will be launches regularly for years to come thereafter. The military would like to swap out a quarter or so of the LEO satellites every year to keep the constellation up to date with the latest gear, Thomas said. The result should be an extremely capable, fast-reacting global reconnaissance network that's far less vulnerable to attack or disruption, he added. That resilience is an important consideration, given the growing anti-satellite expertise of nations such as China and Russia, U.S. officials have said. "We really think the Blackjack approach will change the game," Thomas said. "An adversary who might think that they can go after the monolith — [it] changes their targeting system, puts doubt into their system and probably inverts the cost equation in quite a few of their approaches to disabling our monoliths, in a way that's to our advantage."